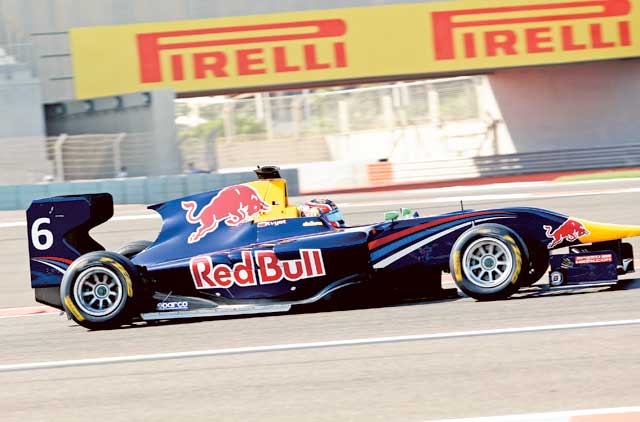 Abu Dhabi: Dominant F1-bound driver Daniil Kvyat of the MW Arden team remained hot throughout Saturday as he clinched the GP3 drivers’ championship title with an authoritative victory in the first race of the GP3 series weekend at the Yas Marina Circuit. Kvyat completed the action-packed 14-lap race, which saw a crash early on, in 1min 59.607sec. Britons Alexander Sims and Nick Yelloly of Carlin finished second and third respectively. “First of all I thank my team, they did an amazing job. I’m really very happy to win here. We were at the top all through and for that the credit goes to the team,” said an elated Kvyat, whose selection by Toro Rosso to go straight from GP3 to Formula One next season provoked some criticism. Conor Daly pulled off a fine move on Patric Niederhauser on lap five to grab fourth place. Niederhauser failed to finish after a clash with Carlos Sainz Jr broke his steering. Three points was all that separated the top two in the drivers’ championship after a stunning run from Kvyat in the qualifying session earlier in the day. The Russian had also posted the fastest time in free practice. Previous series leader Facu Regalia locked up on his fastest lap in qualifying and the ART Grand Prix driver had to start from 10th, before going on to finish 16th in the race. The final race of the season takes place on Sunday.